Sanibel Island Real Estate, Captiva Island Real Estate - Great Deals! Clear Beaches! And a New Crocodile! Great Deals! Clear Beaches! And a New Crocodile! We have only good news from our special Islands! First – No oil within hundreds of miles of our beaches and none forecast in our future. And if any oil happens to appear, many of our resorts are offering full money back guarantees. 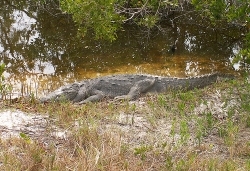 Second – We have a new crocodile living in the Ding Darling Wildlife Refuge. Back in January of this year our previous croc resident (named Wilma) passed away, but last Friday refuge manager Paul Tritaik said a female crocodile was relocated from Grove City, Florida to the Refuge. Our new croc measures about 8 feet long and weighs in at about 150 pounds. She has been tagged and released and hopefully she will become as popular as Wilma. I can't wait to see her! In our real estate news, I still believe this is a great time to come and check out all the deals! Real estate prices are extremely reasonable and interest rates are still low. As of 6/14/2010 on Sanibel & Captiva there were 20 homes and 19 condos under contract, which shows our market is still active! Now is the time to give me a call and check out some of our great listings! Come on down and enjoy our beaches, our fabulous summer fishing and, or course, our world famous shelling!